Ramzan, the 9th month of lunar Islamic calendar involves a month of fasting, with Muslims eating meals only pre- and post-dawn. The holy month of Ramzan is all about maintaining self control and bringing spiritual enlightenment to the body and soul. Self control extends to eating habits as well. The 2 most important meals of a day during Ramzan are Sehri and Iftar. During Sehri, Muslims eat foods which can give them enough fuel to survive all day. Iftar is the time when people end up feasting and gorging on fried foods leading to unhealthy eating and weight gain. Therefore, a good, balanced diet is crucial during this month to prevent weight gain and stay in shape. 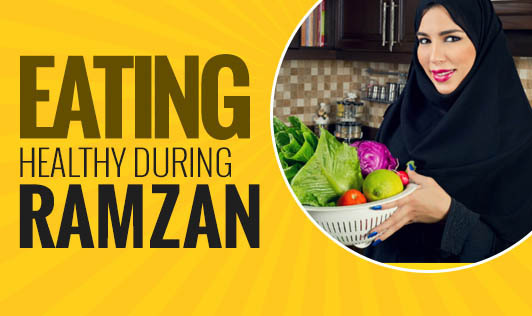 Here are a few healthy eating tips to follow during Sehri and Iftar for a healthy happy Ramzan. Keep your sehri meal wholesome and filling by including fiber- and complex carbohydrate-rich foods like whole grain cereals and pulses, as they break down slowly and keep you fueled during the long hours of fasting. Include foods like eggs, grains, dairy products, and meat along with fruits, vegetables, low fat milk, and nuts. Many people don’t feel hungry early in the morning and tend to skip the sehri. Avoid doing that as sehri will help you sustain the fast. It is always effective in improving your appetite. Eating a very heavy meal to prevent feeling hungry later is an absolute no-no. Eating heavy meals at sehri will burden your stomach causing indigestion, heartburn, and bloating. To improve digestion, sleep early, and wake up at least 10 minutes before dawn. Avoid sleeping immediately after sehri to thwart reflux of stomach content into the esophagus. Avoid drinking too much of tea or coffee early in the morning. Tea contains caffeine, a natural diuretic and thus drinking a lot of tea increases urination, causing water loss and in fact increases thirst. Therefore, it is recommended not to drink more than 1 cup of tea at sehri. Always drink water slowly and gradually during sehri. Drinking too much water too quickly will dilute the stomach’s acid content and cause bloating and indigestion. While foods rich in complex carbohydrates like cereals, potatoes, and pulses are suggested for sehri, individuals should avoid simple carbohydrate-rich foods like candies, cakes, and sweets as they release energy rapidly and make you feel hungry. The body’s immediate need during iftar, is to get a readily available source of energy in the form of glucose. This need is efficiently fulfilled by dates or khajoor. Not only are dates rich in sugar and carbohydrates, they also provide potassium and magnesium required for immediate energy and rejuvenation. Always break your fast with simple sugar-rich foods like dates/figs or fruit juices. Start your soups/porridges along with dates or tea. These are the best food items to have during iftar as they are light and prepare your stomach for dinner. Do not have too many servings of sherbets or sweets as they contain a lot of sugar and are unhealthy. Do not drink a lot of water immediately after iftar, as it will cause fatigue and stomach pain. Avoid heavy meals, as it will put a load on your digestive system and may cause indigestion. If you are planning to have dinner then make sure you keep it light and take it 2 hours after your iftar. Do not overfill your plate with food; take only as much as you can eat. Do not sleep immediately after iftar. Go for a light stroll or just spend some time with family.